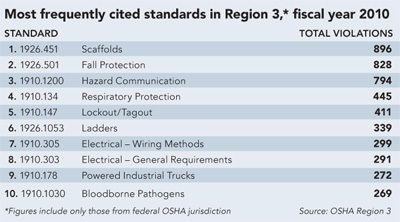 OSHA Region 3 stands out because of the high number of government workers in the District of Columbia. But the region, which stretches across Maryland, Virginia, Pennsylvania, West Virginia and Delaware, covers more than federal facilities and offices. Other industries include logging, shipbuilding, oil and gas, and even wind energy. Each industry brings unique hazards, which the region targets with a combination of strong enforcement and partnerships to promote training. “We’ve been working with developing alliances and partnerships to leverage our resources through cooperative programs with employers and employee associations,” Regional Administrator John Hermanson said. Although OSHA cannot issue fines to government agencies, it does issue notices, which essentially are citations without penalties. Hermanson said Region 3 does a lot of work with Aberdeen Proving Ground, a U.S. Army facility in Maryland. OSHA does not have jurisdiction over military bases, but it does cover civilians on bases. One notable government employer under OSHA watch is the U.S. Mint in Philadelphia. In 2002, the large coining facility had to suspend production for six weeks to address safety issues. Since then, the Mint has made major progress. “Actually, the Mint has turned into an employer that’s in the Voluntary Protection Programs and has a very excellent safety and health program,” Hermanson said. After deadly incidents last year, safety emerged as a major issue for the Metro train system, which runs through Washington D.C., Virginia and Maryland. Although Hermanson’s office only covers trains when they are in the District, he is working with partners in Maryland and Virginia (both of which are State Plan states) and the transit authority to improve train safety. That interaction is reflective of what Hermanson called a “very close relationship” with the state-run occupational safety and health programs in Maryland and Virginia. “We are in constant contact with them,” he said. As in other regions, reaching non-English-speaking and low-literacy workers remains an issue for Region 3. Hermanson cited partnerships with the Mexican Consulate in Philadelphia and the Philadelphia Area Project on Occupational Safety and Health aimed at reaching Latino workers. Region 3 plans to host a Latino summit this month to educate workers on their rights and increase awareness of common construction hazards. The region also is developing outreach materials in Chinese for immigrant laborers in Philadelphia. Finding potential fall hazards is a major priority for the region because falls are the leading cause of death in construction. In FY 2010, Region 3 conducted more than 2,300 fall inspections, resulting in 4,300 serious violations totaling more than $2.6 million dollars in penalties, according to Hermanson. Region 3 also pays close attention to the oil and gas industry. The boom in oil and gas in Pennsylvania and West Virginia includes the gas extraction in the Marcellus shale natural gas field. Hermanson said drilling operations only take a short period of time, so Region 3 inspectors have to time their visits for when workers are present. “It’s a challenge for us to find those facilities when they’re actually doing the drilling,” he added. Other emphasis programs target noise in Erie and Allentown, PA; residential construction in Philadelphia and other cities; shipbuilding in Baltimore and Norfolk, VA; and logging in Charleston, WV.